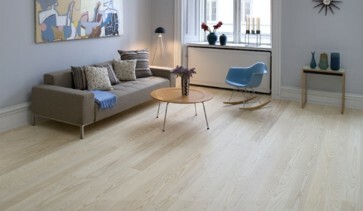 The range of Junckers 100% solid hardwood floors features a fine selection including ash, merbau, sycamore, oak, jatoba and uniquely, press-dried beech. A range of colours, from vivid and light to golden shades and exotic dark. Our woods meet two overall criteria: 1) beautiful colours and grain pattens only possible with real solid floors and 2) long-term stability and durabilty. Most of our woods are available in two designs: wood strip, and wide boards. This makes it possible to create almost any visual expression - and at the samt time get the full benefits of a structural floorboard in terms of unsurpassed functionality.